I am taking a brief one post break from my endless exaltation of the new Wood Elf book to talk about a few non Wood Elf related issues that have cropped up, chief among these issues is all this talk of Warhammer 40k 7 Edtion Patch 6.5. Its a new edition! No, wait. Its actually a expensive update. 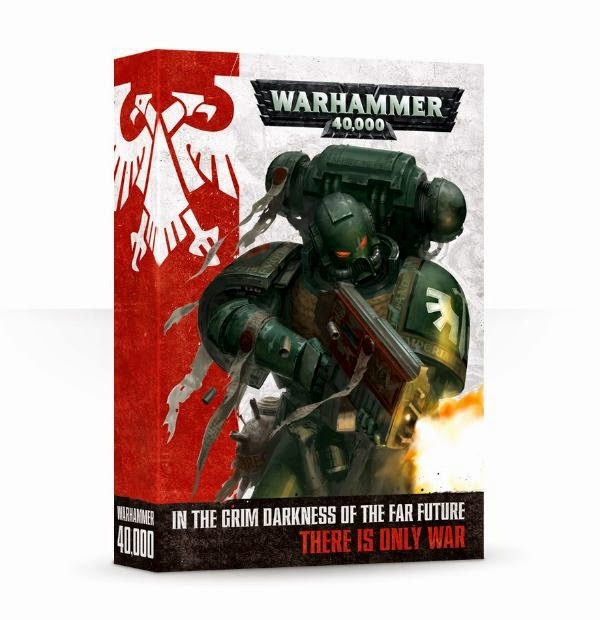 I have had many issues with WH40k 6 edition, some of which i have talked about here on this blog. However this new update fixes most of my biggest issues with the game rules wise. For Example Jink used to be a cover save for moving, so what people would do is move their Eldar tanks one inch and gain a 4+ cover save. Now Jink is a choice that gives you that cover save but forces the tank to only fire snap shots in is next shooting phase, in other words the part of the design studio that does 40k rediscovered balance and we can all be happy and positive about that. Add to this a psykic phase (with a average dispel mechanic) and much more focus on objective missions and this could be a good edition, update, patch, whatever, for 40k. The one thing that i have yet to discuss is Undbound armies and the benefits you get from taking a battle forged army. Now for those who don't know Battle Forged armies are armies that stick to the old force org chart and get bonuses for doing so, unbound armies don't get those benefits but can take literally whatever they want. Now when i was told about this the counter to everyone taking unbound was "But you miss out on the benefits of a Battle Forged army" (to which i said "No bonus/benefit can counter ten Riptides"), unfortunately that argument falls through when you see the laughable benefits on offer. A re-roll on the warlord trait table and having all your units being able to take objectives does not beat a ten Riptide list, or a twenty Lone Wolf list, or a ten Heldrake ten Cultist list. All in all i am looking forward to the new 40k, the rules changes appeal to me and i may try to find the time to fit in a few games. Second on my list of topics is the rumors of 9th ed WHFB coming in September this year. Now i wont talk about what the actual rules themselves (as i have yet to see any rules specific rumors) but i will try to reassure you that 9th will not be a serious departure from 8th. Starting with 4th and 5th ed WHFB the editions have stuck to a cycle. 4th edition was a major rules shift from 3rd edition, and 5th edition didn't change much, it was more of a rules update than a change. Then came 6th which was once again a major rules changes and 7th was once again a rules update. 8th edition was once more a rules change so if GW sticks to their old routine then 9th will be a rules update not a change. What this entails? I dont know but i would put money on it being very similar to 8th with a few changes here and there, oh and a bigger price tag. And that was a cunning segway onto my third topic. A few weeks back i was told about a post on the forum Dakka Dakka (Linked Here). The post was by a fed up Australian GW hobbyist who was tired with the 50% (or there abouts) price increase on Aus GW products. He had sent a email to GW expressing his annoyance with the pricing. For those who dont know NZ/AUS GW products cost about 50% more than they do in England (thats after you calculate for the exchange rate). So i would ask any NZ/AUS gamer who read this post and is annoyed at the NZ/AUS prices to write to GW at au.hobbyservice@gwplc.com and let them know that you too are annoyed and fed up with their prices, it will literally take on longer than 5 minutes and does you no harm to do so, and who knows if enough of us do it perhaps GW will take notice and do something, its a remote possibility but you can only hope. So there you have it, my Non Wood Elf Post. I am going to the Horned Rat Tournament in Wellington this Weekend so expect a full report on that in the coming days, and of course more Wood Elf related posts. Until next time. I would ask all gamers to to email GW. The Australian on Dakka kick started me into emailing GW on the matter and many more followed. So the more the merrier. They will probably send you the same reply we got, but its worth the effort to make it clear there are plenty of others who feel the way we do.